CHICAGO – Former White House chief of staff Rahm Emanuel was elected mayor of Chicago on Tuesday, easily overwhelming five rivals to take the helm of the nation's third-largest city as it prepares to chart a new course without the retiring Richard M. Daley. With 98 percent of precincts reporting, Emanuel had trounced all his opponents with 55 percent of the vote — a margin that allowed him to avoid an April runoff. He needed more than 50 percent to win outright. Emanuel called the victory "humbling" and thanked Daley for his lifetime of service, saying the outgoing mayor had "earned a special place in our hearts and our history." Reginald Bachus, the 51-year-old pastor of a West Side church who voted for Emanuel, said the next four years will be "a very critical time for Chicago. "We really need a mayor who has vision. It's my personal opinion everyone else would have been a manager, and I think Rahm has vision," Bachus said. The other major candidates — former Chicago schools president Gery Chico, former Sen. Carol Moseley Braun and City Clerk Miguel del Valle — had hoped to force a runoff that would have extended the campaign for six more weeks. But they were no match for Emanuel's momentum and money. The campaign began last fall when Daley — with an ailing wife, six terms under his belt and a future in which Chicago's fiscal challenges loomed large — announced he would not seek re-election. Emanuel, a 51-year-old married father of three, will be the city's first Jewish mayor and is a well-known figure in national Democratic politics. He worked for two presidents and served three terms representing Chicago's North Side in the House of Representatives. He's also known as an abrasive, often profane political operative with a famous take-no-prisoners style that was even parodied on "Saturday Night Live." But Emanuel was on his best behavior on the campaign trail, where his swagger and hard edges gave way to unusual calm. He visited all 50 wards and made regular stops at all the city's elevated train stations. He talked confidently about local issues — mass transit, bike paths and after-school programs — and refused to be goaded. His lead in the polls grew and so did his campaign, becoming a $13 million juggernaut. All three of his main rivals tried to put Emanuel on the defensive, casting him as an outsider and questioning his temperament. But he stayed above the fray, and his celebrity made it hard for the criticism to gain any traction. Emanuel had just been elected to his fourth term when he resigned in 2008 to work for fellow Chicagoan President Barack Obama. It was a job he held until he resigned in October 2010 to run for mayor. He had also worked as a top aide to Bill Clinton. Obama quickly sent his congratulations to the mayor-elect. "As a Chicagoan and a friend, I couldn't be prouder," the president said in a statement. "Rahm will be a terrific mayor for all the people of Chicago." Emanuel's relationship with Obama won him votes from a number of people who believed his White House connections would be an advantage. Obama political adviser David Axelrod said Chicago would get "whatever the city's entitled to. 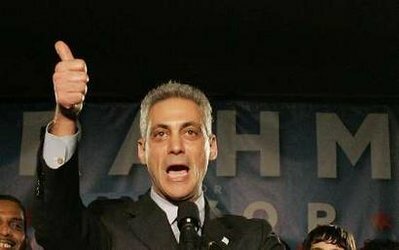 ... And I don't think Rahm will leave one dollar on the table." During his time in Congress, Emanuel served as chairman of the Democratic Congressional Campaign Committee and was credited with leading Democrats to victory in 2006, when they won the majority in the House after a dozen years in the minority. Emanuel will have to decide on a strategy for improving the city's dire finances and may come under pressure to raise taxes and cut services and public employee benefits, though those measures would be politically difficult. The city's inspector general's office warned in October that Chicago's annual deficit was effectively more than $1 billion when combining recent budget deficits with the spending increases the city would need to properly fund its pension system. The new mayor will also have to find new leadership for city schools and a new police superintendent. All the candidates have talked about wanting to replace Jody Weis with someone who has a stronger focus on neighborhood policing. Emanuel's win capped off a campaign that also included an unsuccessful legal challenge to knock him off the ballot over the city's requirement that candidates live in the city for at least one year prior to running. More than two dozen people challenged Emanuel's eligibility because he had lived in Washington for nearly two years while working for Obama, and he had rented out his Chicago home. Emanuel moved back to Chicago in October after Daley announced he would not seek a seventh term. The matter went all the way to the Illinois Supreme Court, which overturned a lower-court ruling that briefly threw Emanuel off the ballot. But all that turmoil seemed far behind Tuesday as Emanuel paid tribute to his supporters. "Thank you, Chicago, for this humbling victory. ... You sure know how to make a guy feel at home."